It’s the question at the heart of the latest Grants in Australia 2018 research report – the biggest report since the inception of the series in 2006. Data scientists Paola Oliva-Altamirano and Joost van der Linden, from Our Community’s Innovation Lab, spearheaded this year’s analysis of a record 2012 responses to examine what makes some grantseekers more successful than others. We estimate that around $80 billion is given away each year, the bulk of it from government, with that figure rising each year. To help crack the secrets of grantseeking success, this year’s study benchmarks a series of grantmaking archetypes that we’ve dubbed “typical”, “winners”, “strugglers”, “high volume”, “big bucks” and the “super-successful 1%”. We also cross-check data across organisations to compare performance by size, sector and funding sources. And for the first time, we’ve produced a “sentiment analysis”, using the power of data to compare grantseeker compliments and criticisms about grantmakers and garner the gist of their views. Finally, we reproduce the most telling of those compliments and criticisms from survey responses, completing a compelling picture of the sector. The latest frame in this long-running movie, now in the final stages of production, carries forward these aims. The responses of the not-for-profits and charities who answered our call to help will further those aims and assist the work of grantmakers, grantseekers, academics and social sector enablers, as well as the Australian Institute of Grants Management (AIGM). You can read the full report below, but here is a summary of our main findings. A word cloud of comments from our survey respondents. Your browser does not support the playing of this video. Please upgrade your browser and then try again. Our sample of grantseekers has submitted more than 14,000 grant applications in the past year. Around eight out of 10 applicants are applying for grants worth less than $5,000. And 40% of grantseekers are relying on state and territory governments for their main grants income. She’s a professional, uses references, applies online, prefers project money to operational support, and doesn’t often bother giving feedback to grantmakers or using professional grantwriters. Staff and volunteers are just as likely to win a grant as are professional grantwriters, our survey reveals. Of course, organisations that use professionals are much more likely to be pursuing a high number of grants, or bidding for big funding pools. Our figures show the same win/loss rates across the board, regardless of organisation size, defying any assumptions that bigger organisations have an advantage here. We conclude that small organisations can be just as successful as large organisations in winning grants, even though, in general, they apply for fewer. Those with more experience in the field routinely win more of the grants they apply for. Of our “winner” grantseekers, more than half have been in the game for more than five years, and more are aged over 50. By contrast, about the same proportion of “strugglers” have less than three years of experience. All our grantseeker archetypes – “typical”, “winner”, “struggler”, “high volume”, “big bucks” and “super-successful” – demonstrate strengths and weaknesses across our measures. Some show exceptional win rates, others pull in more income than others, some lodge many more applications than others, and some unfailingly submit the applications that they start. “Super-successful” grantseekers – those who boast an 80% hit rate, 10+ applications, and $100,000+ raised last year – comprise less than 1% of our sample. What they have in common is that they lodge every application they start, back themselves with references, back their own (considerable) experience rather than that of outside experts, and use their large and well-established organisations to leverage larger funding pools from every sphere, including the harder-to-win philanthropic and federal funds. They tend to operate in the housing, disability, education and health sectors. Most organisations in this study win relatively few grants. Of the small organisations that make up half this study, most are winning an average of just one grant per year and earning less than $10,000 for their trouble. Even the medium-sized organisations included in our survey win just three grants a year on average. There’s a strong correlation between which sector a grantseekers operates in, their win rates, and the value of the grants they win. Nearly 60% of sports and recreation groups drew less than $10,000 in grants last year. Human services organisations, by contrast, are far more likely to get more than $100,000 in grants annually. 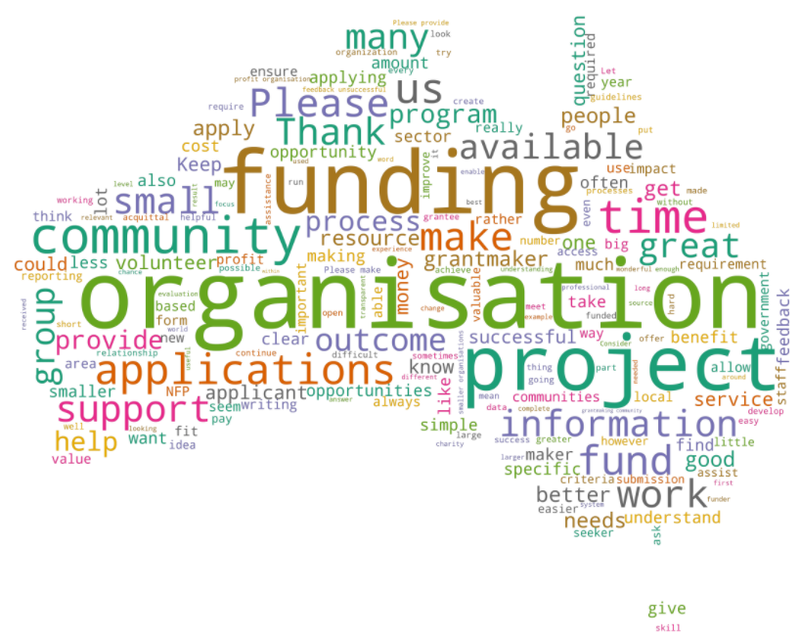 Organisations of all types say that “lack of resources” is their biggest challenge when it comes to winning grants, while the most common desire for non-financial help from grantmakers is for introductions to new funders and strategic fundraising help. Win rates are starkly different from one funding source to another. Philanthropic foundations and trusts are the most difficult source to score from, with organisations that rely most on them for funds citing win rates of just 40%. By contrast, local government funders are the most likely to distribute funds to an applicant, with a 60% win rate for the organisations that depend primarily on them. Despite years of complaints, only 23% of grantseekers say that grantmakers give good feedback on failed applications. Nearly two-thirds of grantseekers say they are facing pressure over the need for increased outcomes reporting, yet only 17% think they’re getting adequate financial or non-financial help to produce such reports. If there was a grantseeker fairy godmother, she would be providing more funding for evaluation, more clarity about what’s required, a simpler submissions process and the chance to submit qualitative information. Grantseekers despise grantmaker deadlines, our sentiment analysis reveals. While it may not be a surprise that there’s a strong feeling about time pressure, grantmakers might want to consider measures to ease the pain. See what else grantseekers said in our “best of comments” summary, online now. We hope these initial findings whet your appetite to know more about the state of the grantmaking sector.